As I continue my exploration of some the notable items in my collection I came across a unique DVD set, ‘The Man from U.N.C.L.E. : The Complete Series’. I received the set review back in 2007 and was only available direct from Time Warner. Subsequently, it is now readily available from numerous online sources as the collector’s edition or in the ‘discs only,' complete series package. At that time I was relatively new to reviewing movies and television series this was one of the first exclusive sets of DVDs that I received. Adding to my excitement is the undeniable fact that it was one of my favorite TV shows when I was growing up. It was a wildly popular series, and its original broadcast dates coincided with my entry into the teenage portion of my life. I would diligently watch the episodes every week, first in black and white and later, as the first significant technological change in my life occurred, in color. Even had to pull a collection of toy guns and other spy equipment; bonding with my friends over the minutia of each episode. 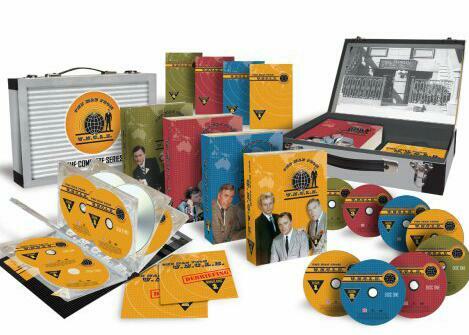 The deluxe set was in a large cardboard box made to look like a briefcase, a regular piece of equipment for spies since the then recently released second James Bond movie, ‘From Russia with Love.' The series ran for four seasons during which it accumulated 105 episodes which take a whopping 41 discs to contaim its entity. This series was the precursor to every spy being show that came after on television. ‘Mission: Impossible,' ‘Wild, Wild, West’ right up to the modern day espionage thrillers such as ‘Blindside’ and ‘The Americans.' With the James Bond movies dominating the cinema and ‘The Man from U.N.C.L.E.’ as one of the most popular shows on TV the imagination of the American public had been captivated by spies. It was only natural considering the social, political situation of the time. This was the Cold War, and the United States and the Soviet Union were doing their best to uncover each of the secrets rolling nuclear arsenals on each side threatening the safety of the entire world. Espionage with the romanticized side effect of this conflict the audience preconditioned by the numerous spy movies during World War II. U.N.C.L.E. is an acronym for the fictional ‘United Network Command for Law and Enforcement’, a secret international intelligence agency. Its main headquarters in New York City with the entrance accessed through a secret door in the back of a changing room located in Del Floria's, tailor's shop in the lower East side of Manhattan. If you can get the scrutiny of the shop owner, actually an armed agent, you go into the small area, turning clothing work in a certain way and you find yourself in a vast underground maze of activity. Issued to each agent were identification badges for the lapel. They were triangular in shape with a unique number. At the top of the organizational chart was Alexander Waverley (Leo G. Carroll), the director of the organization. At the beginning of the series, the agent working for system regularly in the headquarters was a former Russian agent, Illya Kuryakin (David McCallum), who wore badge number ‘2’. While mostly used for support in the early seasons the popularity of the character resulted in a change in the character’s primary function making him one of the most popular field agents of the organization. While on missions he was partnered with the absolute top agent for U.N.C.L.E., Napoleon Solo (Robert Vaughn), the owner of badge number ‘11’. The initial premise of the series was to have Napoleon live up to his name as an agent tackling his mission alone going to his ribs in the gadget supplied by U.N.C.L.E. to help him. The intention was to emulate the format of the James Bond movies, the suave and debonair spy, irresistible to women and fall more ingenious and resourceful than any foe that opposes him. Many of the archetypes and tropes still associated with spy movies and shows themselves etched in stone during this period. Most fans of the genre espionage are irrevocably tied the fancy gadgets. Over in the 007 franchise this tradition tbecamepopularthe third James Bond movie, ‘Goldfinger.' This television series premiered in the same year that was released, 1964 and almost immediately this new series leverage that popular element of the genre. It is important to remeber that the difference in budget between a major motion picture and even the most popular television series is drastic. U.N.C.L.E. bought some of the flashy special-effects or large scale specialized equipment with several pieces of the standard ite ms that agent would use in the field. The main communication device was disguised to look like a fountain pen. For those too young to remember this ever personal experience, a fountain pen was writing that the user would fill with ink contained in a bottle. Upon opening up the pen, the agent would reverse the cylinder within, extended antenna and connect to headquarters. One of the most well-known phrases of the series would be spoken, "Open Channel ‘D’." Alternate do this for communicator item that has fallen out of popularity, was a metal cigarette case. Most recognizable element carried by an agent was the U.N.C.L.E. gun. The mental model rapid came from real-life, a Walther P-38 9mm Semi-automatic. Among its modifications were a barrel extension with hand-grip and silencer, a Phantom Bushnell pistol scope, an extended magazine and a collapsible shoulder stock. The portrayal of the gun was accomplished in such a realistic fashion that it one point the US Army Ordinance General inquiry of MGM permission to follow one for testing. Just before the series was canceled the writers did try to tap into another of an iconic part of the James Bond franchise by creating a unique ‘U.N.C.L.E. car, but it never really had an opportunity to catch on. The television show of that era frequently had a particular format that the episode titles followed. Every episode follows the naming convention ‘The _____ Affair’ with a blank was built in with some word that would relate in some way to the object of the mission. Every secret organization fighting on the side of the equally powerful evil counterpart determined to subjugate the entire world. Opposing U.N.C.L.E. was the diabolical THRUSH. The agents also had a uniquely identifiable weapon a semiautomatic rifle with a large round scope/light mounted in the traditional spot. The mission statement was simple that the ideal they are working to create at only two kinds of people, the masters, and their slaves. They frequently appear to be similar to what the public imagined a Soviet spy would be like to keep a discreet distance from real politics this was never overtly manifested. There was an excellent reason for maintaining this distance from the news. A substantial portion of the population had an understandably intense fear of the Soviet Communists. Their godless society stripped away the individuality that was opposed to the cherished freedoms of the American people. The spies employed by the Soviet Union always depicted as heartless, more overtime than human being operating on a single imperative, to enslave the entire world. These fears were incredibly real and considered frighteningly possible. Only by distancing the storylines such as newspaper headlines was it possible for the series to remain entertaining.The third sarson would immmliment several drastic changes thatwould drastically affect the series. The most exciting of her fans was occuring on all the networks, color broadcasting. This series is on the cusp, one of the most notable examples of the series that changed the color mid-run. It’s difficult to describe the feeling of watching your favorite series going from black and white to what was described by the network as ‘living color.' The series is on the NBC network which adopted its famous pree major nrtworks, eacock highlighting the change in format. Unfortunately, there was also a change in the show runner felt that the series had to compete with various imitators that often presented as he spoof of the genre, resulting in the inclusion of elements of slapstick and the infusion of humor into the stories. The series had gained its popularity during the very seriously minded first season there were examples of a TV mystery at its best result was the opposite effect of what the network had hoped for witnessing a precipitous drop in ratings that eventually led to its cancellation after the four season. The franchise did live on the direct spinoff, ‘The Girl from U.N.C.L.E. which ran for a single season in 1966. A few years later the couple reunion movies had been released as well as re-editing as well as reediting most of the double episode stories into a feature-length movie. Undoubtedly many feel that this is an outdated series, and I won’t deny the fact that statement. Still, this is where all the espionage series we enjoyed today can trace its roots. There are currently two variations of the complete series available. The first was the set in the briefcase container currently out-of-print but still available from third-party sellers on Amazon. To be certain you have the correct item in order make sure that the UPC is 883929035380. The stripped-down disc only variation carries a UPC of 699713664922. There is a considerable price difference with the particular case running over $100 while the discs set costing about $80. In both instances the running time for the set is identical, a massive 93 hrs. 40 mins.